The viral power is that a fan that enters gets a additional entry for sharing the sweepstakes with a friend via the integrated Twitter tool! Fans can come back and tweet again for another entry and so on! Motivate fans to share and reap the rewards of more traffic and engagement on your website or fan page! Includes export option for all entrants and the data on their sharing. Capture, view, and export all entry information. Offers ability to randomly select a winner or multiple winners. TabSite's Sweepstakes PLUS is fully compliant with Facebook's Promotion Policy. How to Setup the Sweepstakes PLUS App? In the Manager section then select the Add App tab. Next, scroll down to the section called the Sweepstakes PLUS Apps. Locate the Sweepstakes PLUS App and click the Add+ button to create the app. Next, Sweepstakes setup starts with Sweepstakes "internal" name, setting of the start and end of your promotion, your chosen timezone to use and the email address where you want to direct all the emails you assume to receive. Here is where you want to design your event. With the use of image, text, and the information of your promotion. Recommended image size for the default layout is 810 x 610 pixels (jpg, png, or gif). 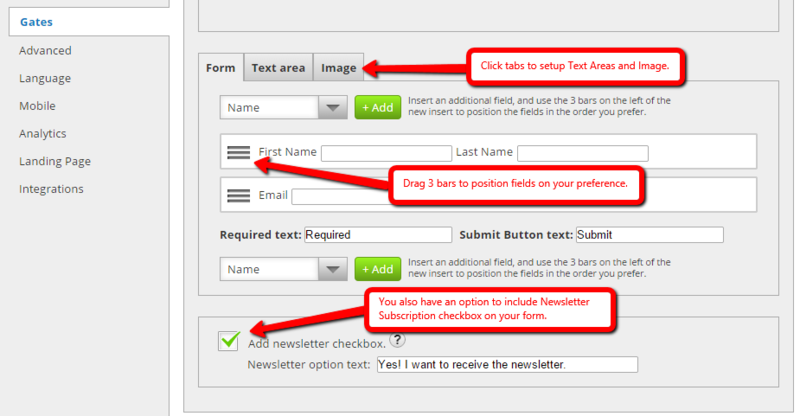 Optimal size will vary with different layouts and the size/contents of any other panels (entry form or text). In some layouts or browser sizes, the image alignment will have no effect. Terms. Here is where you compose your Terms and Conditions for your promotion. Rules. Here is where you can customize your Rules and set the link to the Rules' page. Privacy. Here is where you can customize your Privacy and set the link to the Privacy page. Pre-Sweepstakes. This is where you want to put mechanics for your Pre-Sweepstakes event/promo with the option to put Image, text or both. Post-Sweepstakes. This is where you want to put mechanics for your Post-Sweepstakes event/promo with the option to put Image, text or both. Pick Winner is when you randomly select winner. Publish your tab to Facebook with the help of the Facebook Settings. It requires you to specify your fan page, name of your tab, logo (the recommended size is 111px by 74px) and an icon for your tab. In the lower-right corner of the page is the "Create your own application". It exactly does what its name states and when you're already done doing your application, it requires you to enter your APP ID and App Secret to the blank fields beside these variables. The Promotion Tools has four sub-settings: Social Sharing Options, Blog/Web Call-out Tool, Post Planning and Comment System. NOTE: This is where in the Twitter area you set your default TWEET message! 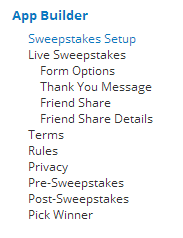 Sweepstakes App.These are settings for your social media sharing on Facebook, Twitter, Google Plus and Pinterest. The information you will put in here will determine how your ad or posts will appear on the social medias mentioned. Generate added traffic by creating a promotional call-out using the Blog/Web Call-out Tool. All you have to do is upload a photo and it will then provide you an embed code. This code can be placed to your blog or website which, in turn, creates a call-out image. When this image is clicked by visitors, they will be directed to your tab on Facebook. 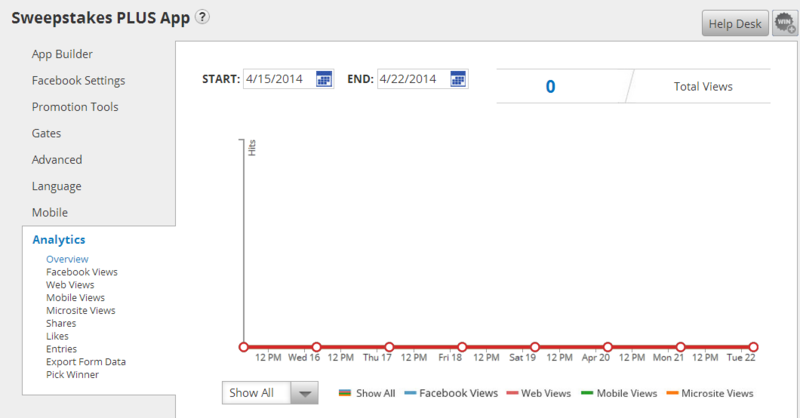 Want to schedule your posts to social networks and publish it at the same time? The Post Planning setting can do this job. There are three scheduling services provided by the page, these are Hootsuite, Sendible and Buffer. However, before you click one of them, see to it that you save your page first. The generated URL for posting is in the form of a SMART URL since it is PC and mobile friendly. Online visitors will be forwarded to your created Facebook tab. Comment System. 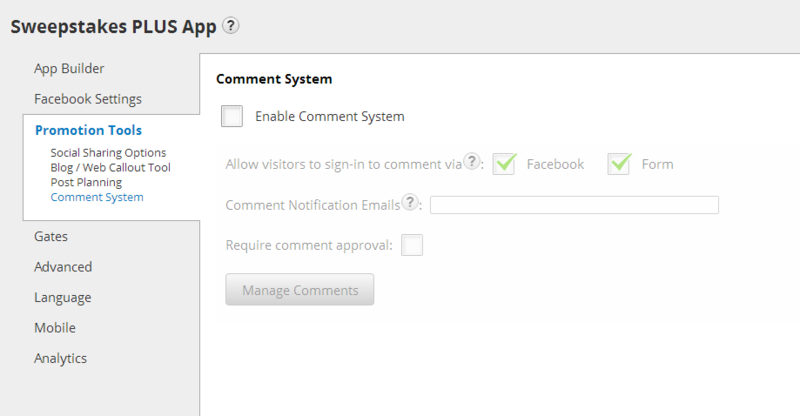 Gives you an option to enable your blog followers to comment on your posts via Facebook and a Form. You can get email notification when someone commented on your post and you can also set comment approval if you prefer. Advanced Setting. You can upload an 810 x 75 pixels header image for your app in this section. Your link color, text color and background color can also be customized in this section. The setting has already provided the default styles for customizing the CSS associated with your app. Another feature to help you with marketing is to implement remarketing pixels! 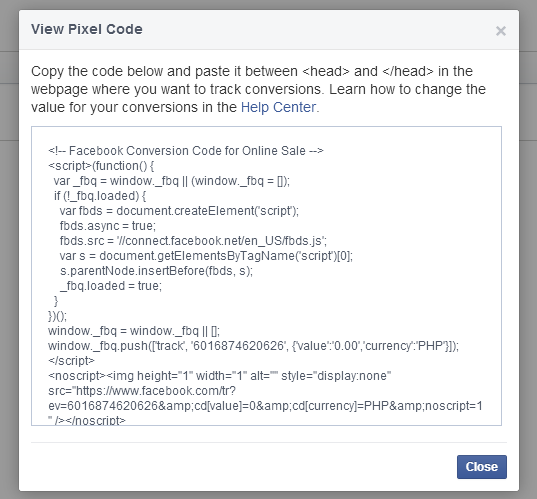 We have a Pixel Tracking code area for Facebook and/ or Google Ads. By installing the pixel code from those services, you are then able to target visitors to your promotion back on that service with ads. Simply paste the pixel tracking code that they provide. We offer the ability to track conversions (entry submissions) on your Sweepstakes that were generated by Facebook Ads. You would need the Conversion code from Facebook and you enter it in the area shown below. This is for use ONLY in Sweepstakes, Sweepstakes Plus and Form & Survey Apps. 1. 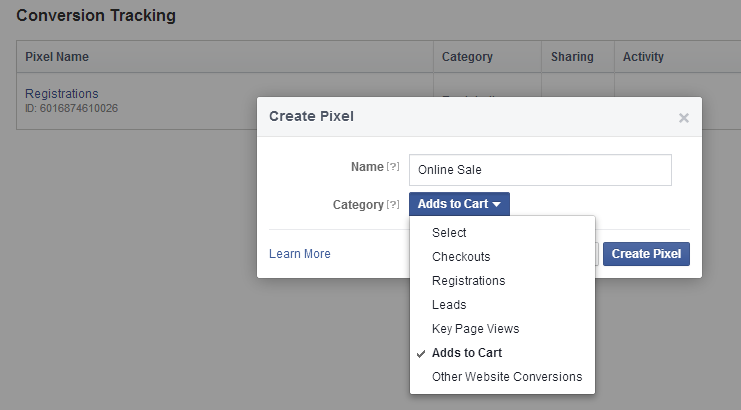 From Ads Manager, go to Conversion Tracking Menu and then Click Create Pixel as shown below. 2. Put a Name to your Conversion Pixel and Choose from the categories on the Category dropdown menu. Click Create Pixel. 3. Copy ALL the PIxel Code that will show on the window. 4. 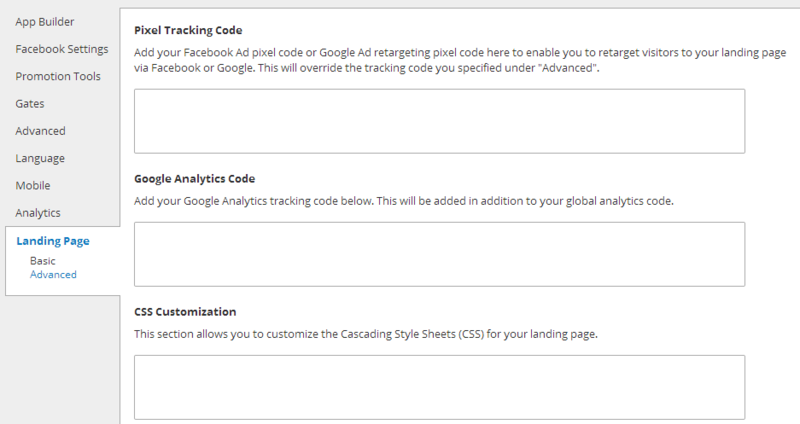 Lastly, Paste the codes in the Pixel Tracking Code within the box in TabSite labeled for it. The Language settings encompass three sections specifically Sweepstakes, General, and the Comment System. 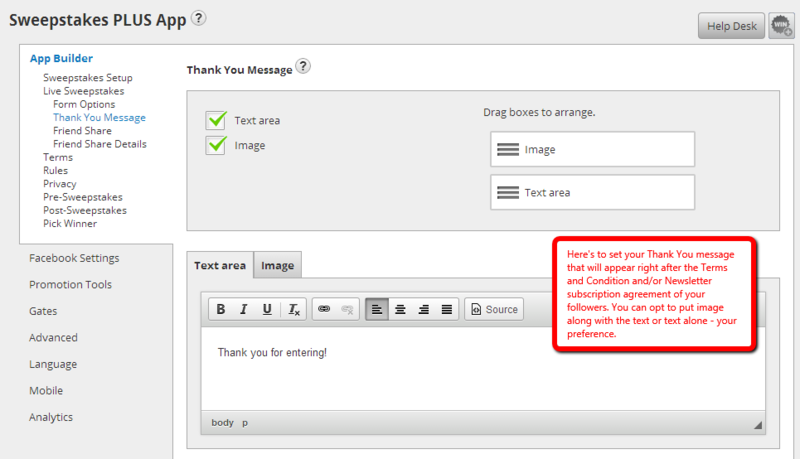 Language Sweepstakes setting is where you can customize captions of your App features. The General sub-setting is composed of two drop-down menus namely "Like button language" and "Tweet button language" which contains a large selection of languages. You can choose your desired language to show in your app's Like and Tweet buttons. When it comes to your Share button, simply customize the default text in the field beside it. 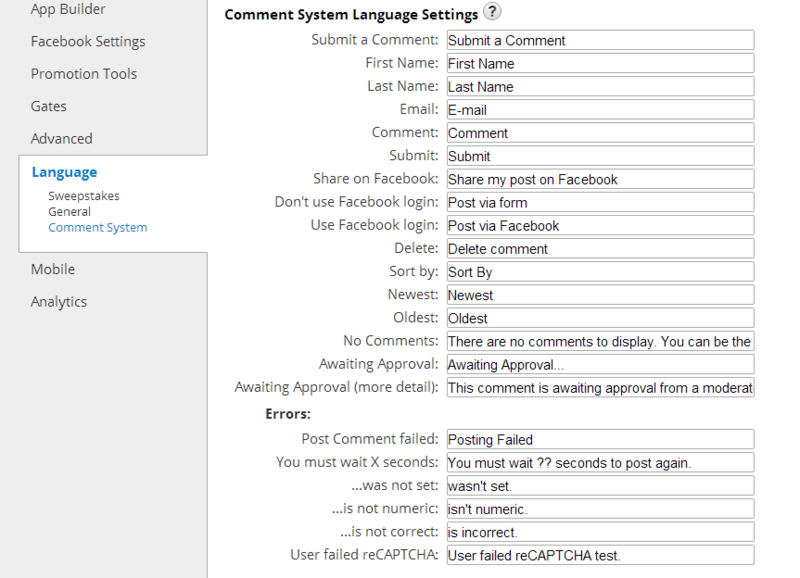 The Comment System sub-setting of the Language section has 2 parts; the Language Settings and Errors. Customize the default input information written on the fields of the variables. The Mobile section has two Global Options: "Render desktop version on mobile" and "Use like gate on mobile devices". The first option lets mobile users gain access the app's content in a mobile-friendly alternate version while the second option displays the similar information in the form of a Like Gate image on mobile devices: A piece of reminder: Not all apps work with Mobile Difference. The moment you have finished editing all the settings, just click the green "Save" button. After clicking the green button, you will then be forwarded to the My Apps page. This is the area where you'll see all the apps you created. In here, you can create another app, test it and finally, publish it in accordance with the features of your Plan.